Diamond D Saddlery was established to offer our customers the highest level of comfort for both the horse and rider. The trademark Diamond D was selected to represent Saddle Up’s success; Highlighting our humble beginnings as a limited hobby to our significant rise as a business in the western horse industry. The tree’s custom design has evolved throughout the years from a diamond in the rough, to a sophisticated tree with the ability to fit the greatest variety of today’s modern horses with the optimum level of comfort in the ground seat. 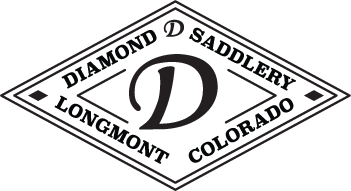 Diamond D saddles are built in Texas by top saddle makers who offer a private label for a select number of saddle shops throughout the United States. Saddle Up has built the reputation and clientele to deserve the honor of one of the labels. Our master saddle makers build the saddles to our specifications utilizing the highest quality Hermann Oak Leather®. Diamond D trees are built on a sturdy, marine fiberglass covered wood tree which allows a slight flex. Our Diamond D tree resembles the strength of a rawhide covered tree, however the fiberglass is far more lightweight.